There’s no need for them to incur international long distance charges or deal with unfamiliar phone numbers. As a busy international traveler, you’re not always easy to reach by phone. One day you could be in London, the next Paris. A few days later, you could be in Milan or Hong Kong. While recording an outing announcement on your cell phone with your current alternate phone number helps some callers find you, there’s a much better way to receive your calls: global call forwarding. Since you want your cell phone callers to be able to reach you while abroad, there are a few steps to take to avoid excessive roaming charges and other potential issues. Here’s how to quickly, easily, and affordably forward your cell phone callers to another country while you’re on assignment or on vacation. First, you’ll need to obtain a global call forwarding number local to your home country. This is a special type of phone number that can be configured to ring to virtually any phone in the world, yet it acts like a local number to your callers. For example, if you live in the United States, you’ll want a US phone number that can be remote call forwarded to the countries you’ll be visiting. Depending on your preferences, this can be either local or toll free. You will later set up your cell phone so that any incoming calls are then forwarded to your global call forwarding number, which in turn, will be forwarded to the phone you’ve designated as your “ring to” number in the other country. Many business travelers buy cheap disposable cell phones when they arrive at their destinations and then configure them as the destination phone for their international call forwarding phone number. Assuming you’ll be traveling from the United States to London and using a disposable cell phone purchased in London, you’ll then set up your global call forwarding number so that it rings to your new London cell phone number. This is easy to do on the fly once you have your new phone number. Now, whenever someone dials the US call forwarding number, those calls will ring to your disposable cell phone in London. This is extremely handy — IF your callers have your new global call forwarding number. If you’d rather keep it as simple as possible for your cell phone callers (as well as keep your travel plans to yourself), you’ll need to configure your cell phone number so that it automatically forwards incoming calls to the call forwarding number, which then rings to your designated phone in the other country. Most modern cell phones include basic call forwarding features. On an iPhone, for example, you’d go to Settings > Phone > Call Forwarding and then enter the destination phone number, which would be the global call forwarding phone number you obtained earlier. In theory, you could set up call forwarding directly from your cell phone to a destination phone in the country you’re visiting. However, this is cost-prohibitive. Using a global call forwarding number, on the other hand, is very affordable. Now that you have your cell phone set up to ring to your global call forwarding phone number which is set up to ring to a phone at your travel destination, you contacts can reach you the way they always do: by dialing your cell phone number. There’s no need to give them your itinerary or a list of alternate phone numbers. As you continue your travels, you can change your ring to number accordingly. 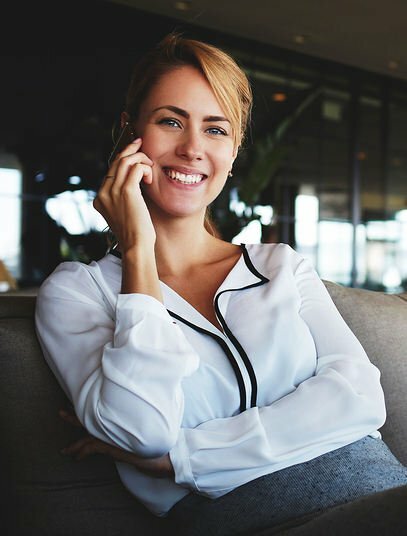 As if the ability to receive all of your phone calls while traveling wasn’t enough, you could also take advantage of some neat features like a customized greeting, fax forwarding, automated IVR, or failover forwarding. Customized Greeting — This is helpful if you want to give your callers a heads up that you’re in a different time zone, or for general purposes. Failover Forwarding — Time zone differences are a valid concern, which is why you may want to use the failover forwarding feature to configure secondary ring-to numbers should you miss a call. With this feature, the call would ring to the next phone number if it isn’t answered in the prescribed number of rings. Setting your cell phone up so that your callers can reach you internationally is a convenient choice. It allows your contacts back at home to reach you simply by dialing the same cell phone number they always call. For them, there’s no difference between calling you locally and calling you while you’re in another country. There’s no need for them to incur international long distance charges or deal with unfamiliar phone numbers. It’s convenient for you, too, as you can rest assured that your most important phone calls will reach you no matter where in the world you may be.